The overall Location Based Services (LBS) and Real-Time Location Systems (RTLS) market is expected to grow from USD 11.36 billion in 2015 to USD 54.95 billion by 2020, at a CAGR of 37.1%. And, iBeacon Technology forms a critical part of this growth as it is forging its way into various verticals at an incredible pace, with 52% growth in the number of sensors deployed from Q3 to Q4 in 2015 and 490% from Q2 to Q4 in the same year. Beacons are helping businesses worldwide boost their sales and deliver outstanding interactive digital experiences to their customers. Though more and more businesses are increasingly entering into full scale deployments after the pilot stage, they aren’t fully aware of one critical aspect. Deciding the kind of deployment needed, helps you in more than one way. 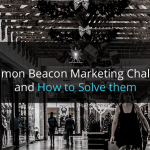 It assists you in understanding the number of beacons you would need to buy, plan a budget for your beacon deployment, create a floor plan, and finalise the Points of Interests for placement of beacons. In our previous blog posts, we have already provided essential tips and solutions for launching your first beacon pilot. In this blog post, we will assist you in understanding the two kinds of deployments and how they are different from each other. With this information, you would easily understand the type of deployment needed for your business. 1) What is Point-based beacon deployment? Point-based deployment is only used when you wish to engage with your customers at specific places or points instead of covering the entire space with beacon signals for the need of high resolution analytics on user path for that space. For instance, if you want to send coupons to your customers only at the entrance of a store, you will use point-based beacon deployment. 2) How many beacons would you need for this kind of deployment? Point-based deployment requires lesser number of beacons than a grid-based deployment because it requires you to cover only specific Points of Interests instead of covering every point of a given location via multiple beacon signals. These specific Points of Interests can be exhibits in a museum, store shelves, entrances to a building, and so on. For instance, if you plan to deploy beacons for 3 different use-cases (Welcome message at the entrance, Discount coupon at a shelf, and Feedback form at the exit) within a store of say 500 sq ft, you will need a minimum of 10 beacons in total. 3) What do I keep in mind while placing the beacons? In a point-based deployment, you put a beacon exactly where you want to interact with a customer. You must survey the space/location once and create a floor plan to avoid any confusion. 4) How to test an app for this kind of deployment? In this kind of deployment, the beacons are placed at particular Points of Interests. The space for interaction between a customer and a beacon is very specific. So, it is essential for a beacon to trigger the assigned action on time. In order to test an app for point-based deployment, test with a single beacon first. 5) How to fix some general issues faced in this type of deployment? Solution: Increase the Tx Power of the beacon. Alternatively, try increasing the advertising interval. Check what works for you. Solution: Since you tested the app and it worked, the problem must lie somewhere in the beacon that’s supposed to trigger the content. Check for its battery level. Solution: Check for things that may be blocking the signal and remove the obstacle if it’s possible. If the is beacon mounted at the corner, try to move it to a side. You can also increase the Tx power. Solution: In case you have already checked to make sure that the right beacon is placed at the right point, then probably it means that the signals are overlapping in that specific area. Decrease the Tx power or interval of the nearby beacon that triggers the incorrect content. Solution: Check if more than 7 of your deployed beacons are visible to your smart device at once. If yes, you need to decrease the Tx power across the board. Ideally, you would not want your smart device to see more than 6 beacons at one go. 6) What is the ideal use-case for point-based deployment? Since engagement with your customers is at specific places or points, it is ideal for SMBs. In case of large spaces, it works best for notifications based on or relevant to specific Points of Interests. How is Point-based deployment different than Grid-based deployment? 1) What is Grid-based beacon deployment? Grid-based deployment is used when you need to cover a larger area via beacons to know the location of your customers precisely in a given space. For instance, a business would need grid-based deployment in order to provide indoor positioning, analytics, navigation, or a configurable environment for alerts based on areas. This kind of deployment requires you to cover the entire area with multiple beacons so that your app, using trilateration, can calculate the exact location of the user. Trilateration is a method of surveying in which a surveyor can obtain distances and angles computed by constructing a series of triangles adjacent to one another. To cover your target location with beacon signals for grid-based deployment, the number of beacons required is more than that required for point-based deployment. For instance, a big store or venue (of say 2500 sq ft) will easily need more than 15 beacons to cover the target location. In a grid-based deployment, you will place enough number of beacons so as to make sure that the entire area is covered by beacon signals to enable trilateration. You must survey the space/location once and create a floor plan, since the same beacon with the same configuration values behaves differently in an empty and a crowded space. For the best accuracy, mount your beacons at least 3 meters above the ground or on the ceiling. Testing a beacon app for grid-based deployment takes up more time than testing it for a point-based deployment. However, this must not deter you from testing it in the process of beacon deployment. Solution: This may mean that your smartphone is registering signals from either too many or just a few beacons. Try different combination of Tx power and distances from the beacons to see if the result changes. Solution: This may result from either the distance being too close between you and the beacons or the Tx power values of nearby beacons being too high. Try reducing the Tx value or the distance accordingly. Solution: Try mounting beacons at different heights and experiment with your Tx power and interval values. Remember while testing, that if you significantly decrease the Tx power, beacons will cover less area. Consequently, you will need more beacons to get full coverage. 6) What is the ideal use-case for grid-based deployment? With all the points in mind, you are now ready to go ahead with the type of deployment your business needs! Did you find this blog helpful? How will these tips help your beacon deployments? Is there any particular takeaway you’ll use in your next deployments? Hit the comments below and share your thoughts!